The diversity of Tokaj Aszús opens up endlessly exciting possibilities in matching food and wine. The combination of low alcohol and marked acidity in sweet wines makes them the perfect match to many Chinese dishes. Considering the basic rules of food and wine matching one can find several reasons why Tokaj Aszús go well with Asian dishes. Chinese dishes can be spicy, hot, sweet and sour and often a combination of these basic flavours. Therefore finding the right wine match requires the consideration of several factors. Chinese dishes are typically intense so the right wine needs to have a similar intensity. To match a sweet dish one needs a wine even sweeter, for a sour dish a wine that is higher is acidtity. The heat of a hot dish is alleviated by residual sugar and by the same token sweetness intensifies spiciness. 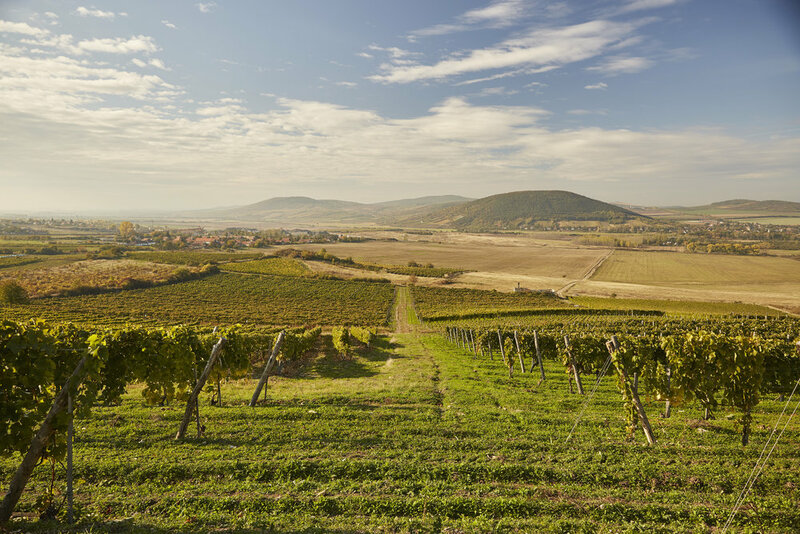 All these factors married to the unique acidity-sweetness balance and richness of flavours of Tokaj Aszús make them excellent choices to accompany Asian dishes. The fruity character of younger Aszús and the more profound, richer aromas of mature examples coupled with the diversity of different terroirs and vintages provides us with wide range of options to find the right wine for our favourite dishes. 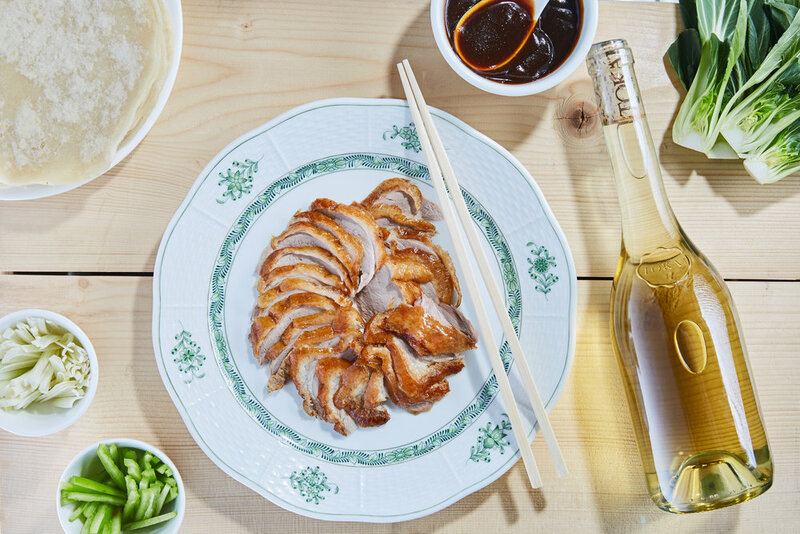 Now let’s take a look at six Chinese dishes and their matches with Tokaj Aszús. For ease of use Aszús are divided into two subclasses. A young Aszú is a wine that is less than ten years old with aromas mainly derived from the grapes and barrel ageing and they offer rich, fresh flavours of yellow stone fruits. In contrast an aged Aszú, one that is older than ten years begins to show the effects of bottle ageing, so there is a shift towards dried fruits, with hints of cigar box and more prominent spice aromas. This classic dish has been mentioned as early as 1330 in a Chinese collection of recipes. Today’s version became popular during the 19th century. The essence of a Peking Duck is the combination of thin and crisp skin with juicy and tender meat. To make the perfect Peking Duck a special oven is needed to roast the Nanjing ducks. Nanjing ducks are raised in a free-range environment and are regularly force-fed. Before cooking the duck goes through a 24 hour process of soaking, seasoning and drying. After cooking it is cut only at the table in order to minimize heat loss. The dish contains mostly skin and some meat. It is served with thin slices of spring onion and cucumber, sweet bean sauce and pancakes. It is one of the most loved and best known Asian dishes. Besides the relatively neutral tasting meat, the raw vegetables and the pancake the explosive flavours are provided by the sweet and spicy, slightly hot sauce. A young Tokaj Aszú’s is a great match with its fruity and vibrant character which beautifully complements the dish. One of the best known Chinese stir-fry dishes it is traditionally made with chicken in a wok. However it is just as good made with the slightly sweet flavoured tiger shrimps and served with crunchy vegetables and roasted peanuts. The dish originates from Guizhou Province but is just as popular in the neighbouring Sichuan Province and today it is known all over the world in different formats. The traditional recipe did not include peanuts but it has become an integral part of most modern versions. The essential ingredients of the Kung Pao sauce are Sichuan Peppercorns and Sichuan-style chili peppers. The peppercorns, the chili peppers, the soy sauce and rice vinager are added to the ginger and the scallions in a pre-heated wok and the shrimps are fried over them. An older Aszú would crash with a sauce that is hot, intense and thick and the shrimp which is slightly sweet. However a young Aszú is a great match, the sweet spices accentuate the aromas instead of overbearing them. The creamy, silken texture of the Aszú tones down the heat of the Sichuan Peppercorns and accentuates the delicate sweetness of the shrimp flesh. A native of Asia and Northern Australia bamboo is the fastest growing and largest member of the grass family. It has been on the menu in Asian cultures for thousands of years. In cooking tender shoots of 3-10 cm width are used which can be harvested almost all year round due to the climate. Spring shoots are considered the best as they are the crunchiest and sappiest. Fresh, raw bamboo shoots – not easy to come by – are best used as quickly as possible to prevent dehydration. They can be used in almost any Asian dish however in restaurants it is also offered as a dish in itself stir-fried with some soy sauce. Preparation is really easy: cut the peeled bamboo shoots into thin strips, heat some oil in a pan and cook with soy sauce and some sugar at a high temperature. It is paramount not to overcook because the shoots would lose their crunchiness. Even with the slightly sweet flavour of the sauce the dish remains fresh so the right match is a young Aszú; the nutty aromas complement the saline taste of the soy sauce, while the oaky notes go well with Asian spices. The cuisine of South East China is extremely varied, using sea food and every edible bit of animals. With the huge variety of available dry land and sea ingredients spices are less prominently used in this region with garlic and five-spice powder being the most typical. There is an emphasis on preserving the original taste of ingredients so steaming and stir-frying is preferred, overcooking is definitely to be avoided. The dishes are complemented by aromatic and richly flavoursome sauces. Pork with sweet-and-sour sauce is a recipe dating back to the 18th century. The pork cubes are marinated in a mixture of sugar, vinegar, soy sauce and rice wine then deep-fried. The meat is covered by an almost caramel-like, honeyed and sticky sweet glaze therefore aged Aszús with their profound aromas are a perfect match. Originally called hong shao rou, meaning red braised pork belly it is also known as Chairman Mao’s Favourite and Shanghai-Style Pork Belly. It is made of pork belly slowly caramelized with Shaoxing wine, soy sauce and stock. Other types of pork can also be used but it is essential to have fatty chunks as well because without them the gel-like, tender texture so unique to this dish can not be achieved. The spicy sauce contains ginger, star anise, cinnamon, chili, sichuan peppercorns and garlic among others. It is braised with these spices until it becomes tender. The birthplace of Chairman Mao’s, Hunan Province is taking steps to unify the recipe so that restaurants all over the world would make just one version of this dish but their efforts so far have been in vain. The deep aromas of the sweet and hot dark and caramelized sauce requires an aged Aszú. The dish is characterized by intense spiciness and almost syrupy consistency that demands a wine of similar intensity. The softness of the Aszú accentuates the tender texture of the meat. Cantonese cuisine is one of the Eight Culinary Traditions of Chinese cooking. The capital of the province was also a commercial port so imported ingredients and sea food were all available and widely used for a long time. Most dishes are made by steaming and cooking not only because they are fast and convenient ways of cooking but also because they help to preserve the original taste of the ingredients. For the same reason fresh and high quality ingredients are preferred and spices are sparingly used. Dishes are usually served with plain white rice. In Cantonese cuisine the main ingredients of sauces are sugar, soy sauce, Shaoxing wine, vinegar, garlic and chili. These are the ingredients for the Cantonese Beef Short Ribs as well. To accompany the cracked black pepper, the chili strips, the five-spice powder and the sweet sauce an aged Aszú is the right choice. The aszú’s honeyed, spicy aromas accentuate the intense flavours of the dish and at the same time alleviate the heat of the chili.